Costa Rica has become a very popular destination for My Vacation Lady’s honeymooners but is it the right honeymoon destination for you? During our unique and very in depth honeymoon consultation, we’ll be able to envision your honeymoon dreams and figure out whether or not a honeymoon to Costa Rica would fit those dreams. Unique boutique properties– we stayed at properties that had 15 -120 rooms and suites spread out over acres and acres of lush tropical rain forests. 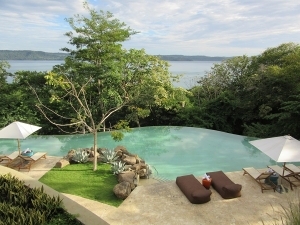 For honeymooners, that means privacy and seclusion. We stayed at all inclusive resorts that include your meals and drinks– a major cost savings for our honeymooners. We saw resorts that are adult only, or have adult only sections, adult only pools or cater to adults, instead of families. Spas– all of the resorts we stayed at or visited has spas to help relax and invigorate honeymooners after the stress of planning the wedding. Imagine a spa treatment out in the lush tropical gardens. Gorgeous nature– imagine sitting on your patio or deck of your cottage or room and listen to the babbling brooks, waterfalls, or rustling of leaves of the lush tropical foliage around you. Jacuzzis, plunge pools, infinity pools and indoor/outdoor showers-many of the properties we stayed at or visited had jacuzzis right on the deck or right in your suite. 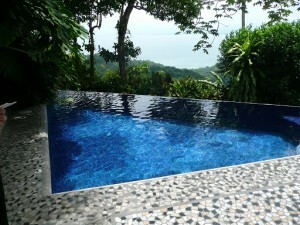 Some had gorgeous plunge pools just steps from your bed with some views that are to die for. We stayed at a boutique resort that had 2 sensational infinity pools and showers that could open up to the outdoors. Food– Costa Rica isn’t just about rice and beans although we did love gallo pinto- the typical Costa Rican breakfast. We dined on some favorite dishes that you would find at home and then some new ones that were fabulous. I will swear that the Mahi Mahi dish I had was the best I ever tasted. Many of the restaurants have their own organic gardens and the fish is caught right off the coast so fresh is the word in Costa Rican cuisine. 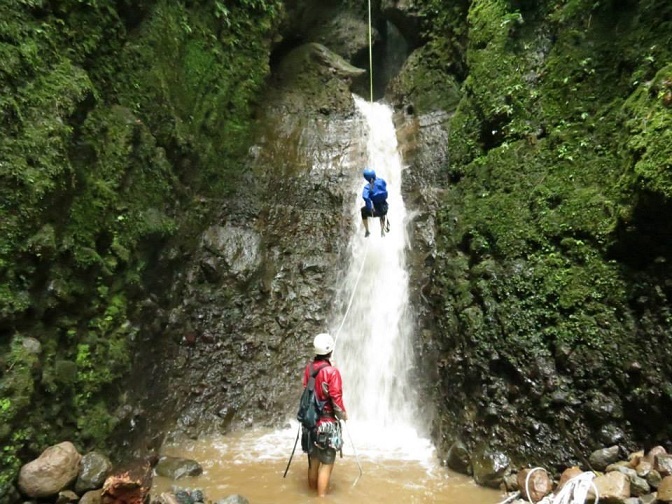 Adventure: Costa Rica is all about activities and adventure. Yes, you can find some of the activities elsewhere but there is so much to see and do in Costa Rica that you may never find in just one country or island anywhere else. 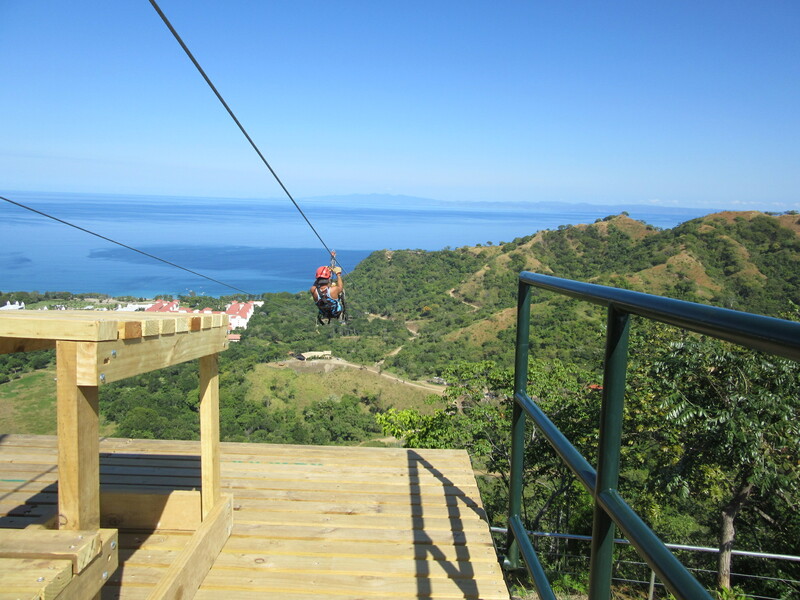 With a new eco-adventure park that recently opened in the Guanacaste region, you can now have ocean views when you zipline! Zip lining– over some of the most gorgeous rain forest imaginable. This is not for the faint of heart. Hiking– we saw waterfalls, babbling streams, butterflies, birds, iguanas, insects, gorgeous plants and wildlife, including monkeys. Horseback riding– this was not a trail that you would likely find back home. We went through small rivers, up and down hills, rode on river rocks and through the jungle. Rafting– you can do white water rafting (levels 1-5 are available) or for the less adventurous, we took a safari float trip where wildlife was abundant. 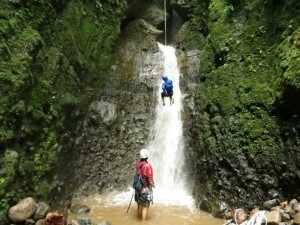 Rappelling– climb yourself up the side of a cliff and under a water fall. Fishing– some of the best deep sea fishing is off the Pacific Coast of Costa Rica for tuna, blue marlin, grouper, snapper, sailfish and more. Fresh water fishing is available in the central valleys. Surfing– Jaco and Tamarindo have some of the best surfing beaches in the Western Hemisphere. 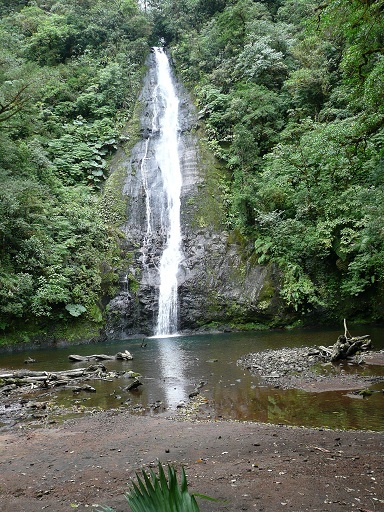 Hot Springs– The Arenal area is known for their hot springs but they are not the only ones in Costa Rica. Soak in mineral baths and mud baths for true relaxation. 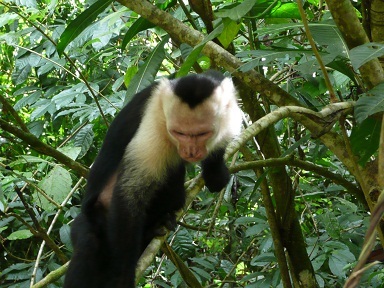 There is so much more to see and do in Costa Rica that it’s hard to list them all. Costa Rica is one of the most gorgeous countries I’ve ever seen and the people are among the friendliest. Did you realize that the waiters won’t just say “you’re welcome” if you thank them (in English or Spanish). They will say “con much gusto” meaning with much pleasure and they mean it. Costa Rica is a wonderful destination for honeymooners who want something more than just a beach. If your honeymoon dream is to lie on the beach with a drink in your hand, My Vacation Lady can certainly recommend a destination that would be perfect for you. Costa Rica may not be that destination, though. While there are some beautiful beaches, as I wrote, Costa Rica is much more than just beaches. My Vacation Lady is the highest rated honeymoon specialist located in New Jersey on both Wedding Wire and the Knot’s Wedding Channel. We take special care to make sure your honeymoon is an experience you will remember for a lifetime. Contact Us so you can experience the My Vacation Lady difference.